The Ramsey County Elections 2018 Annual Report is now available through the open data portal. The report highlights activity in the areas of primary and general election voter turnout, absentee voting, voter engagement, election judges and seasonal staffing. 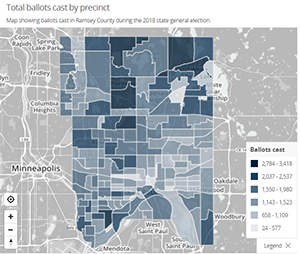 A total of 247,050 total ballots were cast by voters in Ramsey County during the 2018 general election, the highest turnout for a midterm election in the county's history. The total number of ballots cast by city. The total number of ballots cast by ward. Other features include statistical information about training of election judges and seasonal staff, registration of new voters through engagement initiatives, and trends in pre-election voting. Additional information is available by viewing the election results and other election reports. Posted on Friday, April 12, 2019 - 10:52 a.m.